Irish gifts that reflect your heritage tend to stand out among the other Christmas presents under the tree, even for the wee ones. Yes, they no doubt want this year’s hottest toys. They will be excited about those on Christmas morning, but will they still be enjoying them next Christmas? Parents (and Santa) can include some things in the little one’s holiday loot that will add to the festive joy while also creating enduring memories with a bit more depth and meaning while making their Irish heritage part of their everyday life. Cloth books are a staple of early childhood. Reading and examining the pictures together is one of the best ways parents can spend meaningful time with their little ones while instilling a love of reading. Charming cloth books showing numbers and letters with pictures of Irish images such as donkeys, leprechauns and harps can also introduce them to their Irish heritage. In winter, parents in most of the US worry about keeping their children bundled up and warm enough. An Aran sweater will do the job, and an explanation about this traditional garment’s intriguing knot work and history as fishing wear can capture a child’s imagination. If you have an Aran sweater yourself, you can have fun matching. You can choose either a pullover or a cardigan to bundle up your child in. For cuddly time on the couch, your little leprechaun can snuggle under a personalized, cotton throw decorated with shamrocks and a wee leprechaun friend as well the personalized text of your choice. And yes, you can find adult sized throw blankets that make wonderful Irish gifts for grown-ups. Older girls will be delighted with their first real jewelry. Whether it is a bracelet reflecting their love of Irish dance, a bangle featuring a Claddagh or a sweet locket with a shamrock, she’ll feel like a genuine princess when she puts it on, and it will remind her of her heritage every time she wears it. If your little lad or lass dreams of being a sports star, you can get the right clothes to highlight Ireland’s passion for kicking a ball around. 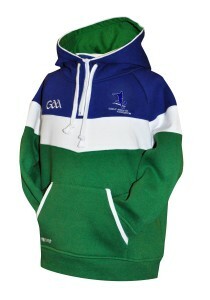 You might not be able to make it to any matches at Dublin’s historic Croke Park, but you keep them warm in a GAA hooded sweatshirt and spark some curiosity about the organization behind Ireland’s social life, sporting passion and county focused sense of identity – the Gaelic Athletic Association. Rugby is a newer love for much of Ireland, but it is definitely well loved, and an Irish rugby shirt (number 32 on the back of course!) is a functional bit of fashion. No matter what kind of Irish gifts you chose for your children this Christmas, they can foster a love of and interest in their heritage. This can boost their sense of identity and lay the foundations for a love of history and literature. Ireland is the land of saints and scholars, after all, and don’t all parents dream of their wee divils being saintly scholars – at least for a few minutes a day? Check out our Irish Gifts for Kids category to find something special for your wee one.